Shukrullah Atif Mashal has been appointed as new chairman of Afghanistan Cricket Board on a 5 years contract. He replaces Nasimullah Danish who had served ACB for past 2 years. The change in leadership resulted after a controversy between Shapoor Zadran and cricket board was leaked to the media. Zadran claimed that he was dropped from the squad due to some issues with some of the board members. Atif Mashal's administrative and International relation experience along with leading Kabul Eagles cricket team added to his importance for this role. President Ashraf Ghani took this opportunity to appoint Mashal as chairman. Afghanistan cricket has achieved remarkable progress in cricket past decade. Mashal praised leadership and management efforts while attending his appointment ceremony and said, “I am very optimistic for making cricket the number one sport of Afghanistan. This is a national game now and people love cricket.” Ceremony was also attended by AFG cricket board members, ministers, parliament members and president office representatives. Mashal endures high passion and enthusiasm for cricket sports and he is willing to go extra miles to improve cricket in Afghanistan. By appointing Mashal as chairman of AFG cricket board, he is trusted with the responsibility of taking the game ahead and great contribution for further development is expected of him. 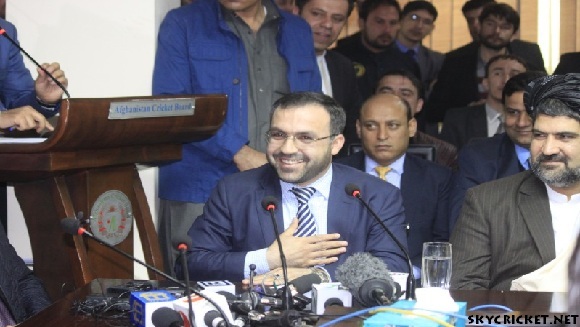 Finance Minister of Afghanistan said in the ceremony, “Atif Mashal knows how to bring innovations in the financial and regulatory climate of the day. He will be a major asset for ACB as we seek to improve the policy and environment of ACB.” Shukrullah Atif Mashal will have to face the challenge of making cricket as one of the successful sports in Afghanistan. For a person like him, it should be a challenge that can be easily achievable with bit of hard work and support from Afghanistan people and government. We wish you good luck with your new role and hope Afghan cricket progress under your chairmanship.